Pankaj Advani won his first international title in China way back in 2003 and now after 15 years he has won another title on the land of China i.e. Asian Tour 10Reds Snooker 2018 – 2nd Championship. The championship was played in Jinan, China and very well organized by CBSA and Mai Mai Sports. Though Pankaj met a very tough opponent Ju Reti who was the winner of 2013 APTC and in this championship he won most of his matches one-sided. The final was also expected to be a tough contest and that too reflected in first frame, but once Pankaj won the first frame, he dominated well the second frame too to take 2 frames lead. However, Ju Reti recovered in third frame but post that Pankaj took initiative in all frames from the start and capitalized them. He was so confident that he finished the last frame with a break of 94 points. 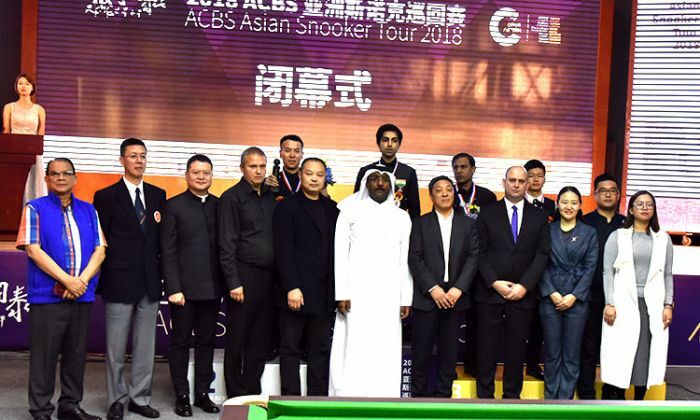 The prize distribution ceremony was graced by Mohamed Salem Al-Nuaimi, the President of ACBS, Mr. Michael Al-Khoury, Secretary General of ACBS, Mr. Joseph Lo, Treasurer of ACBS, dignitaries from Chinese Billiards & Snooker Association and Mai Mai Sports.